Check the filters. Dirty or clogged air, fuel, and hydraulic filters can make equipment harder to start and can cause power loss during operation. Check the battery. Cold weather causes batteries to discharge more quickly and charge more slowly. Workers should know never to charge or jump-start a frozen battery; wait until the battery warms up to 40 degrees Fahrenheit first. Check fluids, hoses, and seals. Freezing temperatures can cause fluids, including hydraulic fluids, to thicken up, which increases the pressure on hoses and seals. Check carefully for any signs of leakage that could indicate a failed line or seal. Check the tires. Pneumatic tires may need a little more air to maintain the correct pressure in cold temperatures, and both solid and pneumatic tires should be checked to ensure that the tread is sufficient for winter operating conditions. Check the lights and wipers. Both lights and wipers are more important in winter, when light levels are lower and precipitation and condensation can affect visibility. Make sure that they are working properly and that your headlights are clean. Check the heater and defroster. Do this especially when it first starts to get cold, since the heater will not have been used in a while. Lubricate moving parts. Moving parts can freeze and seize, so make sure that everything is well-oiled in the winter, and keep your coolant—which also functions as a lubricant—topped off. Warm up on start up. Hydraulics especially need a chance to warm up, so operators should let equipment idle for a few minutes and then should operate each hydraulic function to circulate the oil. Clean it up. Salt can damage your equipment, so clean it off at the end of your shift. Stay freewheeling. 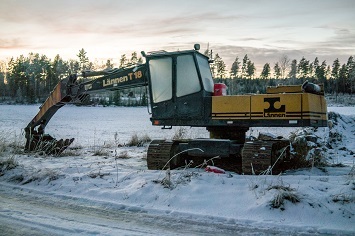 Equipment that sits outdoors overnight or in severe winter weather can freeze to the ground, whether it’s on tires or tracks; when workers go to move it, they can damage it. Park equipment on raised planks, old tires, or some other surface besides bare ground. Raise attachments off the ground, too, while equipment is parked. Tomorrow we’ll look at safe operating tips for heavy equipment operators.